Biometrics or otherwise referred to as biometric authentication is known as a process of identifying humans using their traits and characteristics. This process is utilized in computer science because it serves as an effective form of access and identification control. This process is also used in identifying individuals that are part of groups and who are under surveillance. The identifiers that are now used in the field of biometrics are actually those measurable and distinctive characteristics that are extremely useful in labeling and describing individuals. These identifiers are divided into categories including behavioral and physiological characteristics. The physiological biometric identifier is extremely useful in identifying a person’s voice, hand print, behavior or DNA. The behavioral biometric identifiers, on the other hand, are extremely useful in identifying a person’s behavior with the help of his voice, gait and typing rhythm. Biometrics is also defined by other experts as the technology and science designed to analyze and measure biological data. In the IT industry or field, biometrics can be defined as those technologies that work in measuring and analyzing the characteristics of a human body including voice and facial patterns, fingerprints, DNA, hand measurements and eye retinas and irises for the purpose of authentication. Because of the extreme popularity and usefulness of biometrics, it is no longer surprising if various biometric devices including fingerscanners are now introduced to the public. Most of these devices come with a scanning device or reader, a software program capable of converting scanned data into a digital format and a database capable of storing essential biometric data. If you dream of becoming one of the most renowned experts in the field of biometrics at present, then it is advisable for you to take part in the biometrics certification program offered by Brainmeasures. The biometrics course from Brainmeasures is highly recommended for all aspiring biometrics experts because of its ability to supply the highest level and the most accurate information regarding the field. 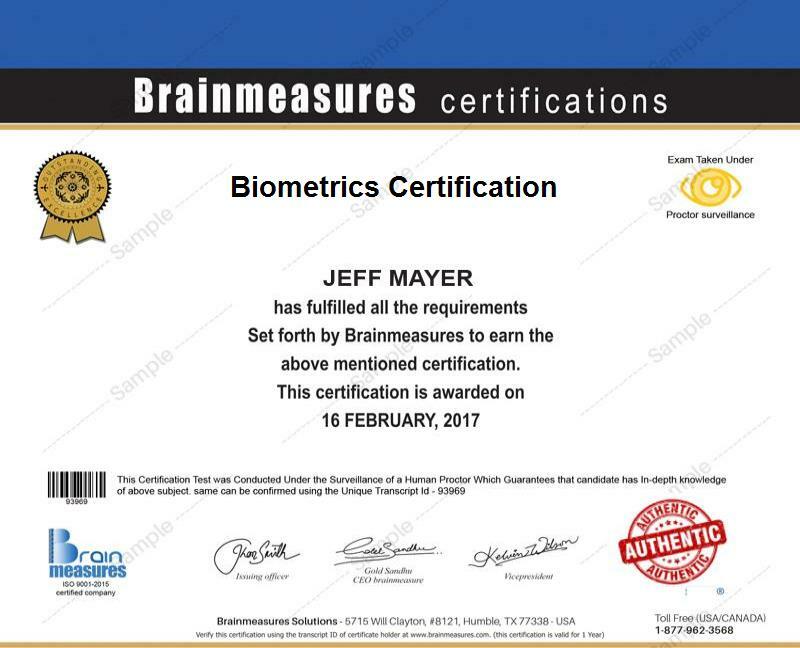 Just like all the other online certification courses offered by Brainmeasures, its biometrics certification course is created in such a way that you will be able to undergo a highly intensive biometrics training so understanding each of the vital concepts that are associated to it will no longer become impossible. It allows you to become more familiar about the methods used in carrying out the biometrics process as well as all the vital and the most effective biometrics devices that you can use for authentication purposes. As long as you finally take a hold of your biometrics certificate, you can start showing the whole industry that you are fully aware about all the principles, standards and theories used in implementing the biometrics process. How to implement, support and maintain your chosen biometrics solution? Enrolling in the biometrics certification course offered by Brainmeasures is extremely beneficial to a wide range of individuals and professionals. You can expect this certification program to work more suitably for managers, supervisors, IT professionals and any other individuals and professionals working in either public, private or government organizations who wish to enhance their knowledge about biometrics so they will have an easier time dealing with issues that are usually linked to security including biometric verification, physical security and security technology. If you dream of increasing the level of your income while also providing your services as an expert in biometrics, then successfully completing your biometrics certification course can help you out. Your biometrics certification is a major help in getting the position of a biometrics technician which offers an average annual salary of $76,000. You can also access a biometrics systems engineer position which gives you an opportunity to receive around $86,000 to $93,000 per year. If you decide to work as a biometrics consultant, then you can expect this profession to offer you an annual salary within the range of $81,000 to $124,000.